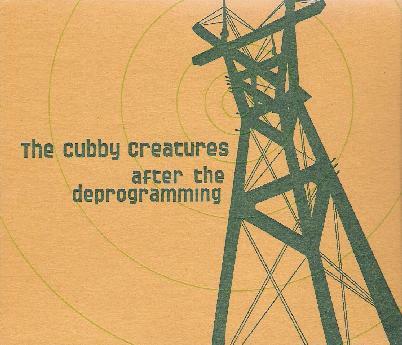 The Cubby Creatures - "After The Deprogramming"
While this San Francisco based band is not on the Elephant Six label, they would certainly not be out of place there along side bands like The Olivia Tremor Control, Apples in Stereo, and Neutral Milk Hotel. Combining a blend of Syd Barrett Era Pink Floyd with an infusion of modern crunch, a social consciousness and even bit of punk attitude along with a dash of the avant-garde, this is psychedelic power pop with a difference. And one of those main differences is the beautiful violin playing of Emily Davis, which lends a sometimes exotic, at other times traditional folksy feel to the music and is an integral part of every song on the album. From lazy acoustic numbers like There's Always Now to raging psychedelic storms like Electric Goat, to loopy instrumentals like Bonemaker's Theme, to plaintive popcraft like Maybe It'd Be Better, the band keeps it always interesting, without straying too far in either the commercial or experimental directions. So even though the music is always inventive and innovative, it remains accessible and an always enjoyable listen. For more information, visit The Cubby Creatures at their web site: http://www.cubby.net. Or visit the Rodent Records web site at: http://www.rodentrecords.com.